The grand and majestic English oak tree is very popular with wildlife as a habitat and food source. The deeply lobed foliage is dark-green in summer and turns shades of bronze and reddish brown in autumn. Acorns add further interest. When the leaves have fallen, the grand, wonderfully gnarled, bare structure is left to grace the landscape. Quercus robur has a spreading form and will grow to 10 x 6 metres in 20 years. Robur is derived from the Celtic 'quer' meaning fine and 'cuez' meaning a tree and we have to agree that it is definitely a fine tree! 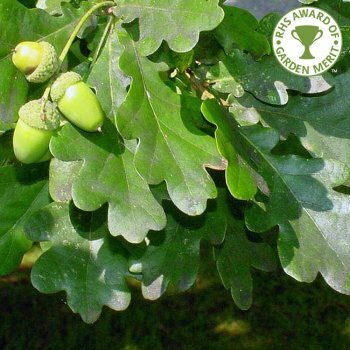 Given the respected Award of Garden merit from the RHS, the native English Oak tree is highly deserving of a place in a large garden. Plant in any, but waterlogged soils. Click here to go to all Oak trees. Our pot grown English oak trees can be planted at any time of the year, whereas bare root oak trees can only be planted between November and March. When planting oak trees, prepare the planting area by removing all weeds and grass within a metre of your desired planting hole. Dig a square hole as deep as your root mass and approximately 2x as wide. To help your tree establish more effectively, we advise sprinkling root grow in the hole, especially if you have poor soil. Gently loosen the roots and place into the planting hole. Using 50% of the original soil and 50% compost, fill in the hole and firm around gently. Make sure not to bank the soil up around the collar of the tree as this can cause problems. We recommend using a stake and if your area is prone to rabbits, we would advise using a rabbit guard. For further information, visit our help and advice section. If you’re planting in spring, summer or dry weather, water well and regularly for the first few months. Make sure to keep an eye on young Oak tree and increase watering if there are extended periods of hot or dry weather. If you’re planting in autumn, you may only need to water your tree a little. We stock a range of irrigation kits to help. Keep the area free of competing weeds and grass for the first couple of growing seasons. Using a glyphosate based weed killer or installing mulch matting and bark chips will aid in this. Native Oak trees develop a well-balanced canopy with little help from us. You can encourage young oak trees to form a clear trunk by pruning the lower branches. This will help to raise the canopy and improve the overall look of the tree. Established Oak trees only require tidying up, by removing any crossing or damaged branches.